These powerful 1 lb. 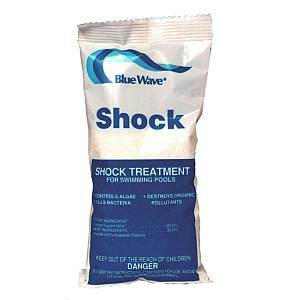 bags of shock treatment for swimming pools & spas are your secret to a successful season! Swimmers, rainfall, sunlight, and leaves deplete chlorine's ability to sanitize your pool. Shock burns or oxidizes these contaminates and replenishes the chlorine level in your pool. 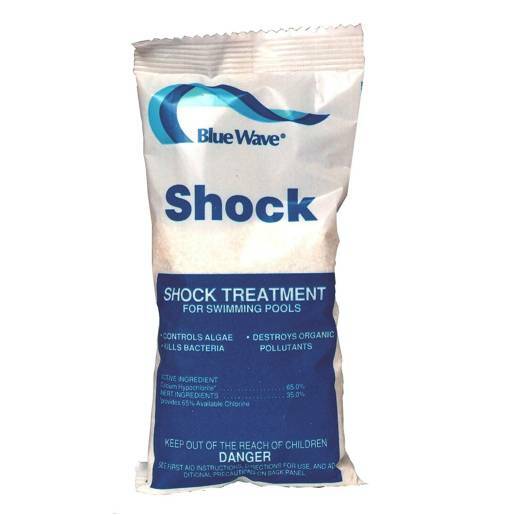 Shocking actually restores your chlorine's fighting power and makes it safe to swim again. Did you know that too much chlorine does not cause those noxious odors, skin irritations, and eye-burning problems? In fact, there is not enough chlorine to oxidize the organic matter. Blue Wave shock is the only solution!! Compare to Sock It, Burn Out®, Sun Burn®, Super-Chlorinator®, and Power Powder®. Dosage: 1 lb. treats 10,000 gallons. Please click here for our MSDS sheets. Availability: Usually ships within 1-3 business days.